A new campaign aims to show how listening and playing music can help patients be happier, healthier and more harmonious. W hen Eileen Pegg developed dementia in 2015, she became very anxious and easily agitated. Her carers at MHA Weston and Queensway care home in Stafford were determined to find a way to make her happier, so they decided to see if music would help. Pegg is not the only one to benefit from these sessions. More than 2,000 residents across MHA’s 84 care homes take part in regular music therapy groups. And it’s not just clinical music therapy that helps dementia patients: choirs, music groups and specialist apps are all beneficial. Music uses different parts of the brain from language, so can be used to communicate with people with dementia, even if they no longer speak or seem to understand others’ words. As a result, it can help them express feelings and ideas and interact with others. It also reduces social isolation and encourages more physical activity through dancing or moving to the music. “Analysis showed that music helps to significantly minimise some of the symptoms of dementia, such as agitation, and can help to tackle anxiety and depression,” says Sally Greengross, chief executive of the ILC. Little wonder then, that the government wants to expand the use of music for dementia patients, as part of its drive to expand “social prescribing”. The NHS long-term plan, published this week, promised to roll out social prescribing, including music and the arts. By April 2021, there will be over 1,000 trained social prescribing link workers and more in place by April 2024, with the aim that over 900,000 people are able to be referred to social prescribing schemes by then, the plan says. These link workers will connect patients to local groups and support services. But it comes at a price: the King’s Fund has pointed out that social prescribing can be more expensive to commission than seeing a GP in the short term. And on average, it costs MHA £30 per person for each music therapy session in its care homes. 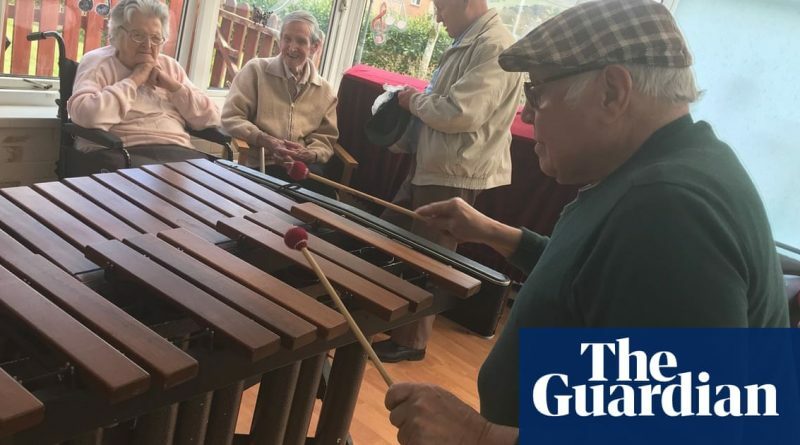 With social care finances stretched to the limit, music is not a priority at many homes, while the availability of community-based choirs and interactive music groups for dementia patients is limited. In a bid to make it easier for commissioners, care providers and patients to find out what services are available and to identify gaps, today sees the launch of the Music for Dementia 2020 campaign. The campaign’s website will share best practice and research and will have a searchable database of suitable music activities for dementia patients. “Part of developing the promotion of music for people living with dementia involves being smart about where we support resources, so we need to know where there’s already good work happening,” says Grace Meadows, the programme director at the Utley Foundation and a senior music therapist at Chelsea and Westminster Hospital. Backed with £1m from the Utley Foundation, with additional ongoing annual funding of £500,000, the campaign aims to increase public awareness and backing for music to be an integral part of all dementia care pathways. The funding will finance local and national projects, scaling them up, helping to introduce music where there is currently little or no existing provision as well as training the workforce. “We want everyone in the UK living with dementia to have access to the music that means most to them and for it to be accessible in the most appropriate and effective ways,” says Meadows. Back in Stafford, Pugh is clear about the importance of music to the lives of those she looks after. “Music is and will continue to be the heartbeat of care for our residents,” she says. Social prescribing: What’s next? The Department of Health and Social Care wants to expand social prescribing in the arts. And there are many museums, theatres and galleries already doing local outreach work that could be harnessed by government and commissioners. Colchester Castle hosts monthly Dance for Parkinson’s sessions, run by the Dance Network Association. Participants are taken to see different artefacts and then use stories behind the artefacts in the dance class. “Lots of the movements we use are specifically designed to target their [Parkinson’s patients’] areas of need, such as loosening the spine and muscles and encouraging the use of the voice,” says Emma Meek, dance development manager at the Dance Network. Tyne & Wear Archives and Museum runs three outreach programmes for health and wellbeing: one for those with mental health issues, another for supporting recovering addicts and those involved in the criminal justice system, and another for those aged over 55. The Holburne Museum in Bath runs a dedicated programme for those with mental health difficulties and homeless people. Participants, many of whom are referred from Avon and Wiltshire Mental Health Partnership NHS trust, take part in professional artist-led classes such as oil painting, and ceramics and can progress to becoming volunteer museum guides too.